Do you suffer from frequent or recurring headaches when you wake up in the mornings? Does your jaw click or pop when you chew or open you mouth wide, such as when you yawn? Has your jaw ever locked into position? Do you have a pain in your neck or shoulder that cannot be massaged away? If you answered yes to any of these questions, you may be surprised to hear that your mouth could actually be the root of your problem. Temporomandibular disorders (TMD) affect the jaw, teeth, and muscles of the face and head. The temporomandibular joint is a hinge joint that connects the jaw to the temporal bones of the skull, allowing the jaw to open, close, speak, chew, yawn, and move from side to side. TMD can often be difficult to diagnose because of the seemingly unrelated symptoms (e.g. neck pain). Drs. Lydia and Randy Muccioli at Muccioli Dental are here to serve our patients who suffer from temporomandibular pain. We can accurately diagnose the cause of your disorder and provide state of the art, personalized care. Many people suffer from TMD due to clenching or grinding the teeth; some people are not even aware that they do it during stressful situations or while they sleep. 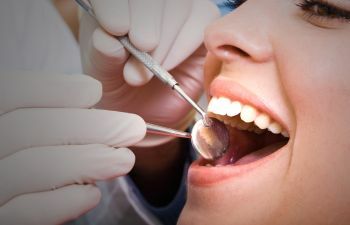 Our dental practice is unique in that we feature an on-site dental laboratory staffed with a team of experienced dental lab technicians. This gives us the exclusive ability to fabricate custom mouth guards and mouth splints in-house to assure the best fit for patients with TMD. Our custom mouth guards are made from the highest quality materials and are comfortable to wear. Other treatment plans for TMD may include restorations to correct a malocclusion or orthodontics. Misalignment of the teeth is a common cause of TMD, and in order to find relief from painful symptoms the misalignment must be addressed. If you suffer from pain in your jaw, morning headaches, ringing in the ears, or clicking of your jaw, please contact Muccioli Dental in Johns Creek. We offer safe and effective treatment for jaw pain, and our practice is currently accepting new patients. Our office accepts dental insurance as well as several other forms of payment. For your convenience, we also offer financing through Care Credit.